​Shaul and Chana Rosenblatt have been leaders in sharing the principles of Innate Health for over a decade and are sought after teachers in England and around the world. More than their credentials, what stands out about the Rosenblatts is the ease and depth of their rapport, affection, and respect for one another. They’re also a lot of fun. Through the recordings of their2-day workshop, join them virtually for laughs and a uniquely valuable look at your already existing expertise for great relationships. See "Schedule" button at right for topics of "Workshop" and "Training." Sample AV quality as per clip at right: "Separate Realities." After purchase, you will receive a link to an unlisted youtube playlist. Taste of the seminar recordings: "Separate Realities"
Shaul grew up in Liverpool and still supports the best team in football. He studied for his smicha at Aish Hatorah in Jerusalem where he met his first wife Elana a”h who passed away in 2001 after a long struggle with cancer. They had four children together and Shaul has a further four with his second wife Chana who he married in 2003. Shaul has written a book, ‘Finding Light in the Darkness’ dealing with the issue of facing hardship in a positive way. Shaul founded Aish UK in 1993 and Tikun UK in 2006. He enjoys most things in life. 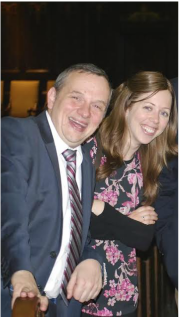 Chana was brought up in Israel, moved to the UK in 2002 when she married her wonderful husband, Shaul Rosenblatt, and is a very blessed mother of 8 children. Chana originally trained in family counselling based on an Adlerian model, before coming across the 3 Principles a few years ago. Having been touched and impacted deeply by these principles and seeing this approach as revolutionary, she turned her focus in this direction completely and graduated from the 3 Principles Professional Institute in 2012. Chana is now a teacher on the One Thought Institute and is working closely with the Innate Health Centre in London. She is a sought after counselor, trainer and International lecturer and a highly regarded educator in the 3 Principles community.